A well-known animal rescuer was found dead of an apparent suicide Wednesday night. No one knew how helpless she was feeling. Manhattan clinical psychologist and author was found hanging in the bathroom of her fifth floor Sutton Place apartment. Stacey Radin, 52, was discovered by her husband, and law enforcement said she was pronounced dead at the scene. She left several notes behind. Sadly, she had a history of depression. Stacey is remembered as the founder of Unleashed NY.org, a program developed to empower young women advocating for animal rights and animal welfare. 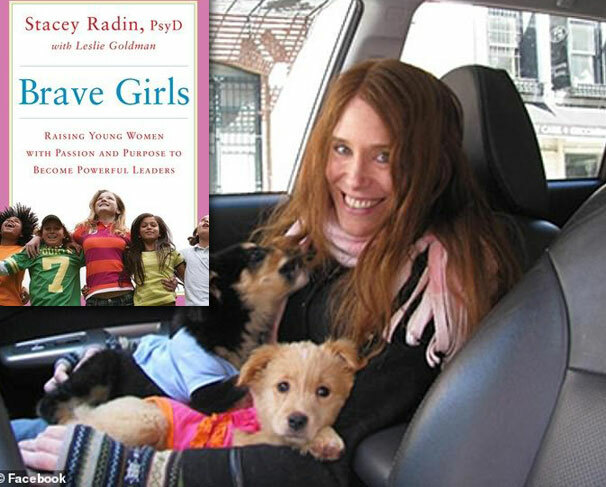 She was the author of: “Brave Girls: Raising Young Women with Passion and Purpose to Become Powerful Leaders”. While Stacey taught young girls that they had a voice and could use it to help animals, Stacey herself was battling her own demons. I read she was a cancer survivor and was still having trouble overcoming it. We really need to watch our friends in animal rescue as there are a lot of “Stacey’s” out there who are very good at covering up mental distress. We’re all sorry because there will be more suicides and most of them will take us by surprise. According to the National Association of State Public Health Veterinarians, Oberon University and the CDC animal care workers are the most likely to commit suicide in America. Our thoughts and prayers go out to Stacey, her family and friends during this difficult time. Please feel free to leave a memorial message if you knew Stacey and her work. Sources other than stated 1 and 2. Please take the time to read these related articles Animal rescue worker compassion fatigue and Animal rescue worker suicide rate. Update (next day): I have a page on her Unleashed program for which she was well-known. Another very sad death in the cat rescuer community concerned Janice Lockamy, 60, who was killed in a road traffic accident on July 2nd 2017 while transporting cats. Stacey was a highly talented and qualified person. She earned her doctorate in psychology from Albert Einstein Medical Center and an MA and postdoctoral certificate in psychoanalysis from Columbia University. She specialised in one-to-one coaching sessions, group sessions, consultations and assessments for leaders of organisations. When she was working her way through university she met women who felt they didn’t have the capacity to achieve. They stayed in her mind and motivated her to empower them through Unleashed (unleashedny.org). Follow Elisa on Facebook and Instagram. Unleashed NY Facebook page here. This entry was posted in volunteers and tagged animal rescue, cat rescuer, compassion fatigue, suicide, The Articles of Elisa Black-Taylor by Elisa Black-Taylor. Bookmark the permalink. Trudy, this post received over 30,000 shares as you may have noticed which indicates the depth of feeling towards this lady. Thanks for visiting and commenting. A wonderful person has left us. RIP STACEY RADIN. Thank you for everything you did while you were here. Thanks for your sympathy and thoughts Alison. Thanks Linda. She was a successful lady. It’s very sad. Animal people are highly emotional people, let’s remember her for her beauty, her kindness, and not judge that sometimes this cruel world is just too much for sensitive souls. We try to force them to live a life they can’t tolerate. She also had cancer and we don’t know how much physical pain she was in. You might be surprised to know that I am not totally against suicide. I believe a soul has the absolute right to make it’s final call when it’s had enough. I wouldn’t judge anyone for it. I wouldn’t say, “If they would have held on just a little bit longer things might have changed…” a soul knows when it’s time to exit. It’s not your life, not your body. In fact, it was just a body they expelled from. They are eternal souls that will live forever. They were cast into a play performance, but didn’t like the role they given, so they exited the curtain call. Well said Toyya and I agree with all you say. Life is harder for people who are decent and sensitive to animal welfare. And we do have the right to check out of life at our discretion. We should not be criticised for it but praised because it takes courage to do so. Thanks for commenting. How about the family she left behind grieving! Their lives don’t matter? It’s a selfish way out! Most if not all people would disagree with you but thanks for sharing your thoughts. I no longer rescue. I may be coaxing a feral out for feeding, fixing and hopefully homing but as far as aggressive rescue goes I am cooked. At some point burnout is inevitable. Is it for life or a period of time I can’t answer but right now my brain cannot hold anymore images that I cannot erase. Thank you Shellie for commenting. If you have a photograph that you can upload that would be great. I could then add it to the page. It would be nice to add to the page some photographs which are not currently on the Internet. Thanks again. Thanks Angel and please stay as strong as you can. You said my thoughts exactly. So very sad to lose another brave animal & human advocate. I did not know of her until now, but what valuable work to have done, encouraging, enabling young people to fulfill their compassionate potential. Depending on her cancer, the treatments for secondaries can be very tough to endure, some times the treatment is worse than the symptoms of the disease. With some cancers, once past treatment for primaries, the diagnosis of secondaries or local recurrance means a diagnosis of incurable (sometimes manageable, life extending etc) disease is made. This can be mentally unendurable for a person. This is so Sad. helping animals is depressing, because you also realize how Mean some people are.such a Shame. All the Good she did. I wonder how bad her cancer was and whether she was suffering from a pain that could only be relieved by medication doctors aren’t willing to prescribe anymore with the opioid crises. Did anyone know her personally? Good point. I’ll do a bit of research on this. Those on the outside see only what a person wants you to see. What you don’t see or hear is the silence of the person who is battling the thoughts that keep going through their heads and won’t stop. There is no escape from the mind. It is very hard to come up out of the hole that keeps pulling you under. There is a part in each and every one of us that absolutely no one is allowed to see. Sometimes the longing for peace is stronger than the will to continue the struggle. The suffering of other beings eats away at the soul.